Chintai is a frictionless peer-to-peer EOS token leasing platform that leverages the revolutionary power of the EOS network. Chintai is the epitome of how communities can align incentives to enhance a decentralized ecosystem for the benefit of all. Developers can flexibly lease tokens based on their respective needs, while token holders can profit from lending network resources that would otherwise be left unused. Chintai was developed and is currently maintained by EOS42. The white paper was first published in late winter of 2018 by David Packham of EOS42. Ongoing funding from BP sponsors provides the network resources that are necessary to run and maintain the Chintai platform. Voting plays a fundamental role in the overall health and security of the EOS blockchain. Token holders that vote provide the glue that hold BPs accountable and incentivizes them to addvalue for the community. Arguably most important, voting secures the network. The more votes there are, the higher the threshold of attack. Chintai fully recognizes and appreciates the importance of voting. In an effort to contribute to the overall health of the EOS network, the Chintai proxy will go live starting December 3rd, 2018. The Chintai proxy will be managed by some of the most informed individuals in the EOS community, and will provide an important model for transparent custodial voting. Note: Several people have asked about autonomous voting and why we don’t offer multiple proxies. Both options are not possible at this time because of system wide limitations in EOS. Furthermore, autonomous voting would require that we create an account for every user. Offering multiple proxies would split the markets up into separate smart contracts that would need to managed. Taking this route would make Chintai highly inefficient and unusable — costs would raise exponentially and the markets would be fractionalized. We are continuing to investigate better options. You agree that Chintai has the sole right to vote any EOS Tokens we hold on your behalf in any way we choose. You hereby waive any and all claims against Chintai for such voting. A poll was taken by the sponsors to elect five Managers. Representatives from EOS Cannon, EOS Detroit, EOS New York, EOSYS, and EOS Nation will make up the first iteration of Chintai Managers. The management of a proxy with this size must be transparent, fair, and responsible. 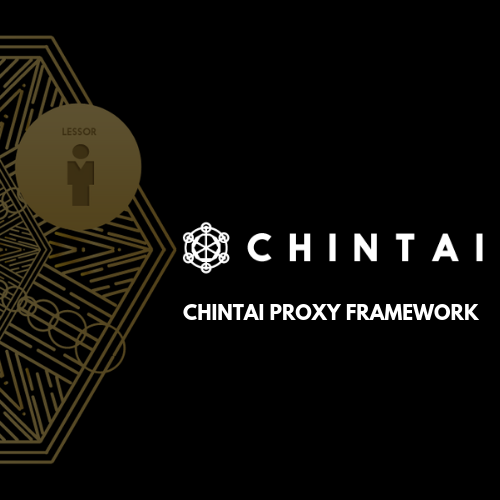 To this end, Chintai has assembled a decentralized framework to facilitate the proxy management. Five “Managers” from within the BP sponsors were elected by the eleven sponsor groups. Each governor possesses a deep understanding of EOS and the qualities that will make ideal candidates for the Chintai proxy. These five will make the initial voting selections of the first twenty-five spots. Selection reasoning will be made publicly. An application process will be made public for the last five spots. Chintai has offered invaluable contributions to the EOS network. The resource exchange has powered many dApps and users through chronic CPU shortages, without charging a single fee. Sponsors have enabled Chintai to be fee-less by reinvesting their block rewards to power Chintai. Because the sponsors have provided direct value that has enabled Chintai to offer a crucial service for the EOS mainnet, sponsors will be selected for the first installment of proxy vote choices. However, sponsors will be subjected to ongoing evaluation and will not be chosen on the basis of being a sponsor in future votes. Proven technical competency as a block producer. Adherence to the EOS Constitution. Usage of block rewards in a community focused value-add manner to the EOSIO ecosystem. Support development of dApps that promote mainstream EOSIO adoption. Transparency in block producer operations. Read more about the framework here. 친타이는 EOS 네트워크의 혁명적인 기술을 이용하는 frictionless P2P EOS 토큰 임대 플랫폼입니다. 친타이는 커뮤니티 안에서 참여자들의 이익과 탈중앙화된 생태계의 강화가 어떻게 일치될 수 있는지 보여주는 본보기 입니다. 개발자는 필요에 따라 유연하게 토큰을 임차 할 수 있으며, 토큰 소유자는 사용하지 않는 네트워크 리소스를 통해 수익을 얻을 수 있습니다. Chintai는 EOS42에 의해 개발되었으며, 유지관리되고 있습니다. 친타이의 백서는 EOS42의 David Packham 이 2018년 초 겨울에 처음 출판했습니다. BP 스폰서들의 지속적인 후원은 Chintai 플랫폼을 운영 및 유지하는 데 필요한 네트워크 리소스를 제공해주었습니다. 투표는 EOS 블록체인의 전반적인 건강과 보안에 중추적인 역할을 합니다. 투표권을 행사하는 토큰 소지자들은 BP들이 EOS 네트워크에 가치를 더할 수 있도록 권한을 위임합니다. 가장 중요한 것은 투표가 네트워크를 보호한다는 것입니다. 투표 수가 많을수록 악의적 사용자의 공격이 힘들어집니다. Chintai 는 투표의 중요성을 충분히 인식하고 있습니다. Chintai 프록시는 EOS 네트워크의 안녕에 기여하기 위해 2018년 12월 3일부터 실시간으로 시작됩니다. Chintai 프록시는 EOS 커뮤니티에서 가장 많은 활동을 하며 정보를 얻는 사람들이 관리하게 될 것이며, 투명한 커스토디안 투표의 본보기 모델을 제공할 것입니다. 2018년 11월 6일 Chintai 플랫폼에 대한 이용 약관을 규율하는 Ricardian 계약에 다음과 같은 통지가 추가되었습니다. 친타이의 초기 스폰서 BP들은 다음과 같습니다. 이들 중 5명의 Chintai Managers (투표 관리인)을 선출하기 위해 투표를 실시했습니다. 그에 따라 EOS Cannon, EOS Detroit, EOS New York, EOSYS 및 EOS Nation 의 대표가 Chintai Managers 의 첫 번째 멤버로 구성됩니다. 이런 대규모의 프록시 투표 관리는 투명하고 공정하며 책임이 있어야 합니다. 이를 위해 Chintai는 프록시 관리를 용이하게 하기 위해 탈중앙화된 프레임 워크를 구축했습니다. BP 스폰서 내의 5 명의 “관리인”은 11 개의 스폰서 그룹에 의해 선출되었습니다. 각 관리인은 친타이 프록시에 대한 이상적인 후보자가 될 자질과 EOS에 대한 깊은 이해를 가지고 있습니다. 이 5 명은 첫 투표를 위한 25명의 BP 를 선발합니다. 나머지 5명의 BP 선발은 공개 신청을 통해 이루어 질것입니다. 전체 관리 프레임 워크는 여기(here)를 참조하십시오. 이 프레임 워크에 대한 자세한 내용은 아래를 참조하십시오.